PBS has just released an essay on The Video Game Revolution which debunks several of the myths that continue to spread about video gaming. The list was compiled by Henry Jenkins who is the director of comparative studies at MIT. Most of us older gamers already know that most of the arguments against gaming are bunk. But it’s always nice to hear an egghead from MIT back us up. The PBS site also cites every source they use for each of the eight myths listed below. According to federal crime statistics, the rate of juvenile violent crime in the United States is at a 30-year low. Researchers find that people serving time for violent crimes typically consume less media before committing their crimes than the average person in the general population. It’s true that young offenders who have committed school shootings in America have also been game players. But young people in general are more likely to be gamers â€” 90 percent of boys and 40 percent of girls play. The overwhelming majority of kids who play do NOT commit antisocial acts. According to a 2001 U.S. Surgeon General’s report, the strongest risk factors for school shootings centered on mental stability and the quality of home life, not media exposure. The moral panic over violent video games is doubly harmful. It has led adult authorities to be more suspicious and hostile to many kids who already feel cut off from the system. It also misdirects energy away from eliminating the actual causes of youth violence and allows problems to continue to fester. Intentionally or not, the McCain camp owns the domain name VoteForTheMILF.com. I dunno if that’s funny or sexist… or both. Probably both. The site will redirect you specifically to a video intro by Gov. Sarah Palin at JohnMcCain.com if you are hitting it for the first time. Note that the redirect sends you first to JohnMcCain.com and THEN to Palin.htm (Palinâ€™s Video Intro) if youâ€™re visiting for the first time, or if your cookies are cleared, or if youâ€™re not accepting cookies. Since the story broke the domain WhoIs information has gone private, but I think the cat is out of the bag. 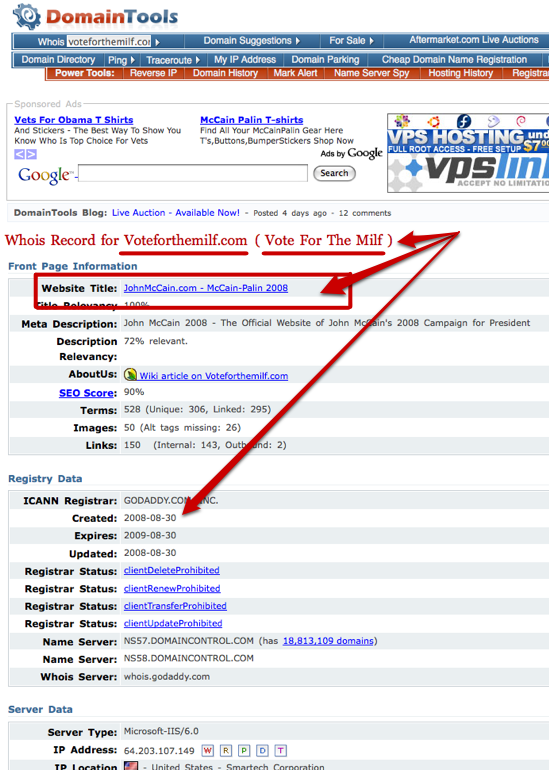 There’s a full discussion along with breaking updates over at Govgap.com’s John McCain Owns VoteForTheMILF.com? article. On last night’s Colbert Report, Stephen cut through all of the doom and gloom of the Democratic Convention by profiling someone who’s flourishing in the current economy: A repo man. Others who are probably doing well these days include unemployment-office workers, squatters, pan-handle makers, trashcan-fire emporiums, tumble-weed manufacturers and super-villains. What do Atheists and Christians Really Believe? Personal Data and Attitudes towards Science, Journalism, Politics, etc.